What does a Pool Scouts Franchise Cost? Make a splash in the Pool Services Industry with Pool Scouts! A Pool Scouts franchise is a seasonal business opportunity that can be run from virtually any home or office. It’s a great stand-alone business or a nice complement for someone with an existing home-based business. Pool owners have been craving a more professional approach towards pool service and Pool Scouts is their answer. Take advantage of Pool Scouts' low franchise fee and a corporate team with over 80 years of franchise experience. Learn more today. Why do people have pools in the first place? The promise of fun, cooling off, relaxing and enjoying time with friends and family. What dims in comparison to the bright glow of good times is the work involved in getting to experience that fun, relaxation and enjoyment. Having a pool takes work to clean and service, costing homeowners valuable belly-flop time. Pool Scouts gives back the gift of time. Our technicians are trained – and trained again – in testing, monitoring, treating and servicing pools so customers don’t have to do it themselves. With ongoing service as well as help at the beginning and end of the swimming season, we make sure pools are always swim-ready! 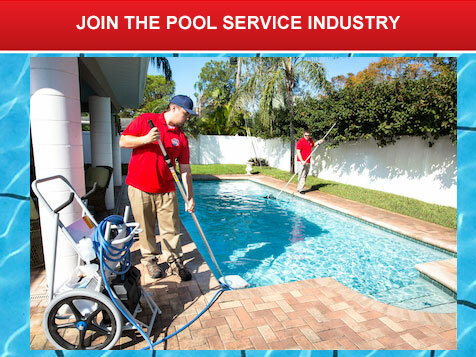 The pool service industry is poised to clean up. With more than 10 million residential pools in the USA, the need for quality pool service is evident. Many homeowners, tired of the DIY-route (and not necessarily successful at it) are looking for professionals to relieve the burden of home-care, and specifically pool service and care. For stressed-out owners, just looking at a pool is no fun, especially when it’s unclear what lurks at the bottom of it. Pool Scouts service makes jumping back in irresistible. We guarantee Perfect Pools, Scout’s Honor! Servicing a pool can be complex. Our training programs are designed to get you up to speed quickly, and keep you learning on an ongoing basis. Experts from all disciplines – operations, marketing, finance, and customer service – work with you to build your franchise and make it a success. You can be your own boss, but you’ll never go it alone as part of the Pool Scouts troop! The Pool Scouts franchise model gives you the independence you’re looking for in running your own business, but it’s backed with a strong support team at the home office to provide guidance, answer questions and be there for you when you need a lifesaver. The day you sign on as a Pool Scouts franchisee, we are working for you. We help you navigate the waters to a successful and easy-to-manage operation. A Solid Brand: Pool Scouts has a memorable name and a strong brand that captures the spirit of our work. Customers associate scouts as trustworthy, honest and prepared, and they’re right! Our marketing materials and messaging all point to that trustworthiness, but with a tongue-in-cheek approach that keeps customers smiling and keeps us top of mind. Marketing Expertise: We provide our franchisees with access to a complete suite of promotional materials (e.g., signage, van-wraps, letterhead, etc.) and the strategic support to deploy them successfully. By arming you with proven methods and effective marketing tools, you can focus on customers and growing your business, the Pool Scouts way. Call Center: When customers call, we help franchise partners be responsive. The Pool Scouts Line is ready to receive calls 24/7 so your customers can count on a human experience to establish customer loyalty early on. Best in Class Business Management Tools: Our innovative communications and tracking tools are unique in the industry and simplify the customer recruitment process, your marketing and scheduling activities. In addition, we offer training and assistance in accounting and record-keeping for our franchise partners. Training and Continuing Education: Before launching your Pool Scouts franchise, we provide you with a complete training program at Pool Scouts Headquarters in sunny Virginia Beach, VA. Your Pool Scouts education is a comprehensive curriculum covering everything from equipment operation and regulatory compliance to marketing strategies and leading business practices. Learning and maintaining Pool Scouts’ high standards of quality service is dynamic, which is why we also offer ongoing training to our franchisees. Dedicated to the core, the Pool Scouts organization is here for you at all times. Feel free to pick up the phone and call, whether you need answers, advice or just to say hi. You’re never alone with Pool Scouts. We're looking for franchise partners who are motivated and ready to make a commitment to their future and the future of Pool Scouts. This is a great opportunity for someone looking to add a home-based business to their portfolio and who can build relationships, lead a team, and has the motivation to excel!. Potential candidates must have a minimum liquid capital of $30,000. 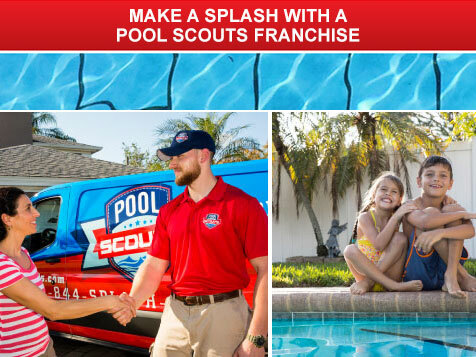 If you’re interested in owning your own home-service business, Pool Scouts offers a great opportunity and the lowest franchise fee in the pool services industry. Please fill out the form and a franchise development representative will be in touch with you shortly. We look forward to speaking with you! Disclaimer: The information contained on this portal is not intended as an offer to sell a franchise or the solicitation of an offer to buy a franchise. In addition, this information is not directed by Pool Scouts Franchising, LLC to the residents of any jurisdiction that requires registration of a franchise prior to offering and selling the franchise in that jurisdiction. It is for informational purposes only. If you are a resident of one of these states, Pool Scouts Franchising, LLC will not offer or sell a franchise in a jurisdiction that requires registration unless and until the offering has been duly registered and declared effective by such jurisdiction and Pool Scouts Franchising, LLC has complied with applicable disclosure laws.